As we debated the best answer, the team realized that our recommendations really depended upon the makeup of the traveling group. The answer for visitors with young kids (6 and under) is significantly different from the answer for a group with older kids (7 and up) or a group with teens or no kids. That sparked an idea for an eight-part series. 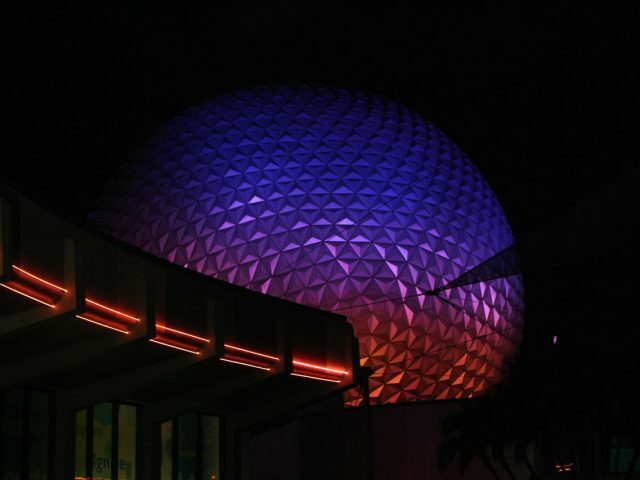 Over the next several weeks, we’ll make recommendations for first time visitors to each of the four Disney parks. 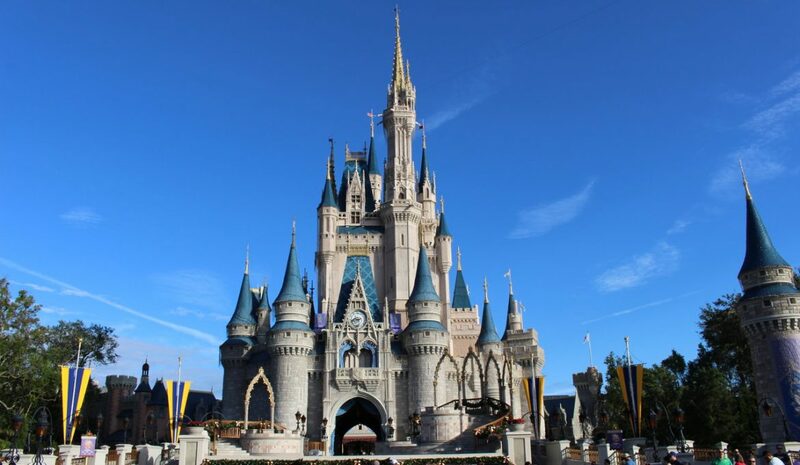 Today’s blog focuses on the Magic Kingdom for young kids. Our next edition will be Epcot, then Animal Kingdom, then Hollywood Studios. After we cover traveling with young kids, the series will go back to all for parks, but this time with recommendations for groups traveling with older kids or adults only. 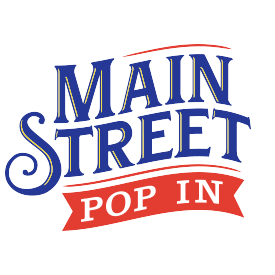 To make sure you don’t miss out on the discussion, become a subscriber to the Main Street Pop In newsletter. We’d love to hear your suggestions. Please add them to the comment section below. Now keep in mind that every family is different, so not every option is going to work for everyone. 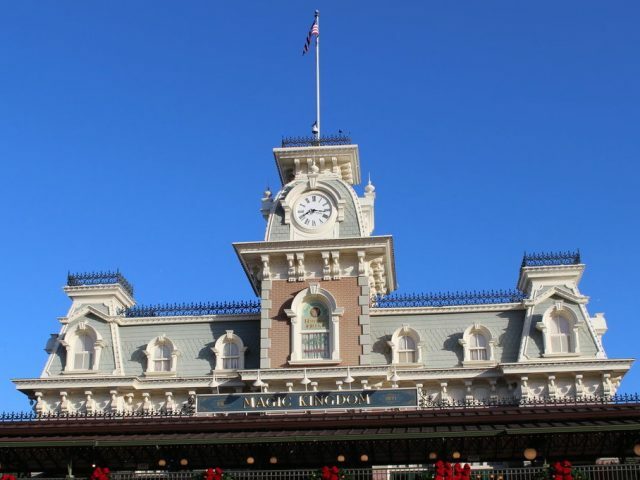 However, from our vast experience and lots of trips accompanying other first-time visitors, these are the attractions that led to more magical moments than meltdowns. 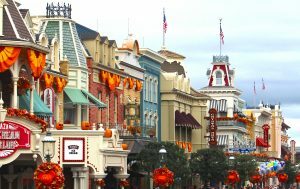 No matter the makeup of your travel group, make sure you don’t skip walking down Main Street, U.S.A. There’s a reason Walt Disney laid out the park the way he did. Your first encounter is meant to transport you from reality into fantasy. If you let it, entrance into the Magic Kingdom can become its own attraction. Guests literally pass through a tunnel and emerge into a fabled version of Marceline, Missouri, where Walt spent time as a kid. On Main Street, U.S.A. all the storefronts are pristine and inviting. Greetings are harmonized by a barbershop quartet. An impressive bouquet of balloons hovers overhead, held with one hand by a vendor who looks like he or she could be lifted off at any moment. At the end of Main Street is Cinderella’s Castle. The details, the clever names for each shop, the music, the smells coming from the bakery—all of it is a Broadway musical come to life. Bonus Tip! Don’t neglect to ask one of the many Disney photographers on Main Street to snap a photo of your party. After the photographer takes a professional shot, ask for another photo using your personal phone or camera. On a first trip with young ones, head straight for Fantasyland. Buy a bucket of popcorn for breakfast or a Mickey Ice Cream Sandwich! 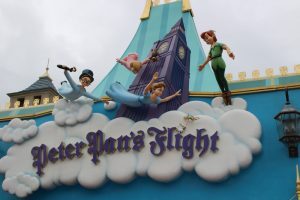 Take in the attractions in this order: Peter Pan’s Flight, “it’s a small world”, The Many Adventures of Winnie the Pooh, Dumbo the Flying Elephant, The Barnstormer, Prince Charming Regal Carrousel, and Mickey’s PhilharMagic. (I recommend Peter Pan’s Flight first because the line gets really long, really quick. This is a “darling” ride, but not worth an hour or more wait. If you are using the FastPass system, Peter Pan’s Flight is definitely a FastPass Worthy Ride.) Fantasyland is also home to the Seven Dwarfs Mine Train, which is a fun rollercoaster for kids who like thrill rides. If you think it’s something your kiddos would love, and they are 38 inches or taller, add this to the list. Make sure and grab a FastPass for this attraction 60 days before your arrival if you are a resort guest, or 30 days before your arrival if you are not. Head from Fantasyland to Tomorrowland. 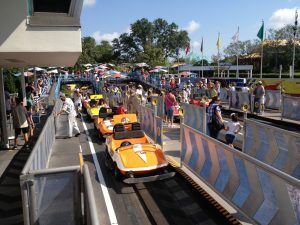 You’ll encounter the Tomorrowland Speedway first, which kids love, especially if you let them steer while you push the gas pedal. Also entertaining is the Buzz Lightyear’s Space Ranger Spin, where riders use lasers to hit targets and collect points. Don’t miss Space Mountain. Even if your kids are too small or don’t want to ride it, make sure all the grownups in your group get to ride this classic. (Click here to read more about Space Mountain) Ask a castmember working at the entrance about using a rider switch. One grownup rides, while the other watches the children, then the grownups swap without having to wait in line again. When you are the parent waiting with the kids, ride the PeopleMover then the Carousel of Progress—two attractions that are quintessential Disney and relaxing. Both Cinderella’s Castle and the Crystal Palace offer character meals. Choose the location based on whether you want to eat with princesses or Pooh and friends. 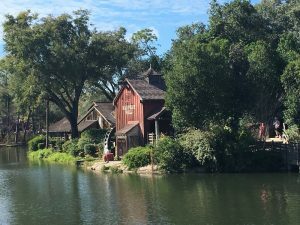 For young kids, the stockades are a fun photo op, the Country Bear Jamboree is all silliness, the Frontierland Shootin’ Arcade is old fashioned fun, and Tom Sawyer Island is a place a kid can run ahead without getting swallowed up by a crowd. Sail upon the classic Pirates of the Caribbean attraction and then browse the pirate shop afterward. Try the Jungle Cruise next (reserve an afternoon FastPass in advance) followed by a trip to Aloha Isle for a beloved Dole Whip. (The corn dog cart in Adventureland is also pretty good.) If your family has the energy to climb into the fantastical Swiss Family Treehouse, go for it. Whether the treehouse is an attraction or just stairs is a huge debate among Disney fans. Don’t wait until the end of the night to browse for souvenirs. This is a fun afternoon activity. The Emporium is where you’ll find your traditional goods and toys. Young kids will be less interested in the offerings across the street: purses, jewelry, crystal and other things that cannot be touched. 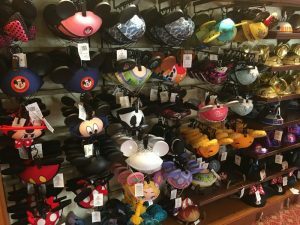 They will love Main Street Confectionery, however, and The Chapeau, where the perfect ears hat is just waiting to be found. Not everyone loves a parade, but kids usually do. 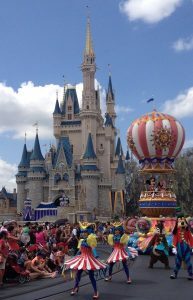 The Festival of Fantasy Parade marches down Main Street every afternoon, so it’s easy to pop out and see all the action at the end of your shopping spree. The nice thing about the parade is that the characters ride up high on floats so you can generally see even if you are not in the front row. If you are staying at a Disney resort, I highly recommend returning to your hotel in the late afternoon for a nap, swim, or quiet time. 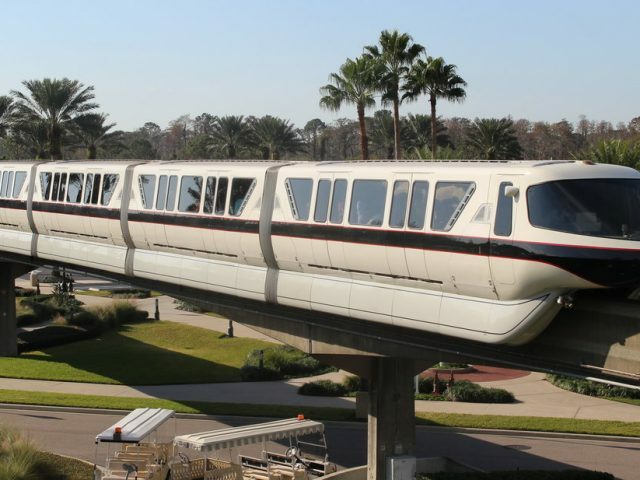 If that’s not possible, leave the park for a few and take a trip on the famed Monorail. Resort hopping offers a small break from the crowds and noise. See Mary Blair’s mosaic of the Grand Canyon at the Contemporary, have Kona coffee or something stronger at the Polynesian, or stroll the lobby of the swanky Grand Floridian. I hear Cinderella and Prince Charming make an appearance around 3:30 p.m. (except on Tuesday). If you have a stroller, the sway of the vehicle may even put your little one to sleep. This is the perfect opportunity to stroll the grounds of any of these three resorts as your child rests. This one is optional. The fireworks at Magic Kingdom are lovely, but for the five-and-under set, sometimes it’s hard to stay up that late. If you have a child who can sleep in a stroller, you can watch the fireworks from the shores of the Polynesian Resort where the noise is reduced. Another option is to save the show for a future visit. There’s no shame in putting the kiddos to bed, pouring a glass of wine, and catching the fireworks on YouTube.